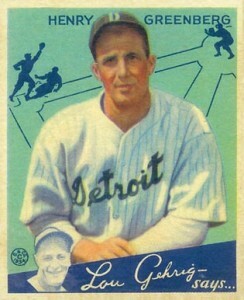 Hank Greenberg, baseball's first Jewish superstar, gave four seasons of his professional career to military service in World War II. That patriotic act kept him from reaching the amazing statistics other power hitters in the 1930s and 1940s attained, yet he still holds some impressive slugging records. 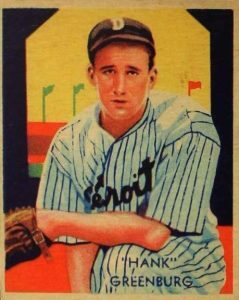 In the list below you will find some of the best Hank Greenberg baseball card appearances, including several key Goudey sets from the 1930s. Greenberg, a New York City native, was recruited to play for his hometown New York Yankees as an amateur, but chose to attend college and signed with the Detroit Tigers the following year. He debuted for a single game as the youngest player in the American League in 1930 but it would be three years until he would become a starter for the Tigers. 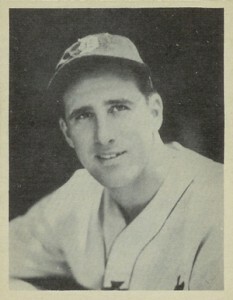 By 1935, Greenberg was the American League MVP and led the league with 36 home runs and 168 RBIs while also bringing the Tigers a World Series title. Shop for Professionally Graded Hank Greenberg Cards on eBay. 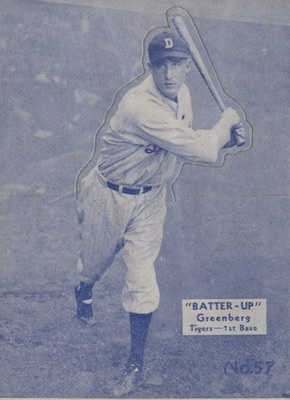 Greenberg's power at the bat earned him nicknames like "Hammerin' Hank" and "The Hebrew Hammer." He smacked an amazing 184 RBIs during the 1937 season, an impressive feat that was matched by his 58 home runs the following year. 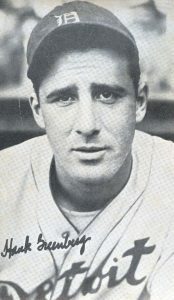 Greenberg repeated as AL MVP in 1940 when he lit up American League pitching for 41 home runs, 150 RBIs, and was the leader in slugging percentage and total bases. After volunteering for military service in 1940, he essentially missed four full seasons from 1941 to 1944. Despite the gap, he would return to form and led the league in home runs again during the 1946 season. Greenberg retired after the 1947 season with a .313 career average and 331 home runs, but his totals probably would have been closer to 500 dingers had he been given those four seasons back. Nevertheless, Greenberg was selected into the Baseball Hall of Fame in 1956, becoming the first Jewish player enshrined in Cooperstown. While not a direct part of his MLB career, the military played a huge factor in Greenberg's life. Cards dedicated to Greenberg's military service during World War II have been included in many different sets and collectors can find some in 2015 Panini Cooperstown, 2011 Tristar Obak, and 1994 Upper Deck Ken Burns Baseball. One of his most rare card appearances is in the 1946-1947 Propagandas Montiel Los Reyes del Deporte set that was produced in Cuba. This set features boxers, wrestlers, Cuban players, and some of major league baseball's all-time stars (including Greenberg). The design is simple as it displays a player photograph on the front with a bright orange border surrounding it. It is extremely rare to find a copy that is in near-mint or mint condition. Because Greenberg's career ended just before the trading card resurgence of the 1950s, his key options fall in the relatively rare releases of the 1930s and early 1940s. 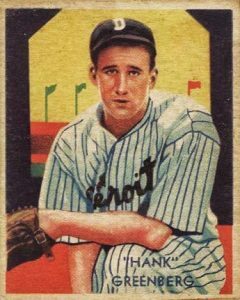 Each of the Hank Greenberg card appearances on this list attract high prices so card design, historical significance, and collector demand also contributed to the final order. The 1934-1936 Batter Up set would appear closer to the top of the Hank Greenberg list if it was more available to collectors. The unique product allowed fans to make their own stand-up figures with the card by folding the top over and, because of this, many cards were effectively destroyed shortly after being issued to the public. The most common color variation is black-and-white but rare colors like blue (pictured below), pink, and green were also produced in limited quantities. To compliment their lines of traditional baseball cards, Goudey also issued several series of photo cards that have been given the nickname "Wide Pen" because of the larger font used to sign the players names. Over the two years they were issued, there were several different designs produced, including Type 3 (on the left) and Type 5 (on the right), which vary in lettering font size, the photo dimensions used, and if the card has a white border or is full-bleed. 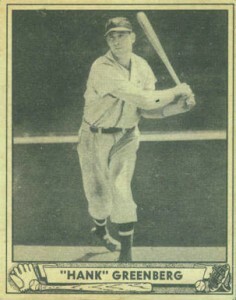 While 1939 Play Ball was the beginning in the new era of trading cards, the set suffers slightly in popularity for its lack of colorized photography. The set is also notorious for including each player's full name on the reverse side of the card. 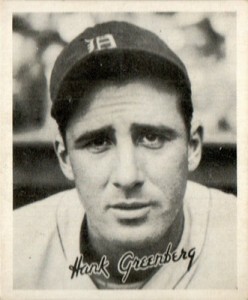 However, Greenberg's name is listed as "Henry Greenberg" on his card when his true name was Hyman Benjamin Greenberg. To avoid anti-Semitism, Greenberg used the more Americanized "Henry" or the more common nickname of "Hank." If there is one particular set from the 1930s that I wish could have continued on in production it would be the Diamond Stars release that was produced by National Chicle between 1934 and 1936. The set incorporated painted photographs with original art deco backgrounds to create a beautiful composition. 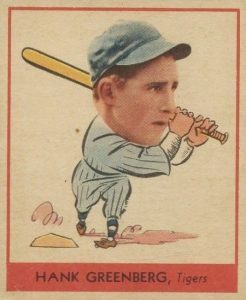 Greenberg has two versions of his Diamond Stars card as the first edition misspelled his last name as "Greenburg." It was corrected in subsequent releases and the error version (on the left) commands a higher value. 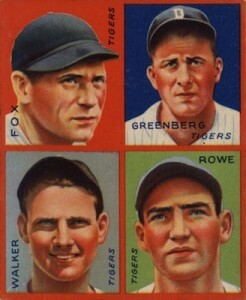 Greenberg shares his 1935 Goudey 4-In-1 card with some of his Tigers teammates: outfielders Pete Fox and Gee Walker and pitcher Schoolboy Rowe. All four men were All-Stars during their careers and they helped the Tigers to back-to-back World Series appearances in 1934 and 1935, with the team beating the Chicago Cubs in 1935. Each individual card back from this set forms a piece of a nine-card puzzle, including a puzzle that produces the Tigers team photo. As you can see, the differences between 1940 and 1941 Play Ball are mainly just cosmetic. The 1940 set featured the similar black-and-white photography as 1939 Play Ball, while the 1941 set took that same image and painted it in vibrant color. While the 1940 Play Ball featured a robust 240 cards, the 1941 set only had 72 cards on its checklist, signally that this would ultimately be the final Play Ball set produced. 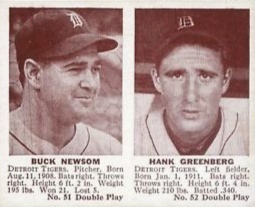 Hank Greenberg has two different cards in 1941 Double Play with one portrait card and one in-action card. The portrait card features him alongside Tigers teammate and long-time pitching veteran Bobo Newsom. The duo helped the Tigers get back to the World Series again in 1940 but they ended up coming up short to the Cincinnati Reds in seven games. 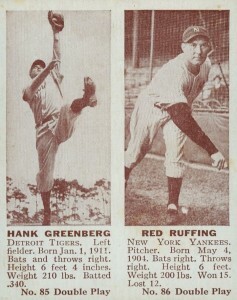 The in-action card features Greenberg with New York Yankees pitcher Red Ruffing. Both players are Hall of Fame members, giving the card a bump in value with collectors. Since he passed away in 1986, collectors must turn to cut signatures or signed memorabilia to find an autograph of Hammerin' Hank. Through the years, the SP Legendary Cuts set has regularly offered Greenberg cut autographs on their checklists and some of the highest quantities available can be found in the 2002 set. Hank's autograph is quite unique as he frequently signed using small letters and a slant to the left even though he was right-handed. 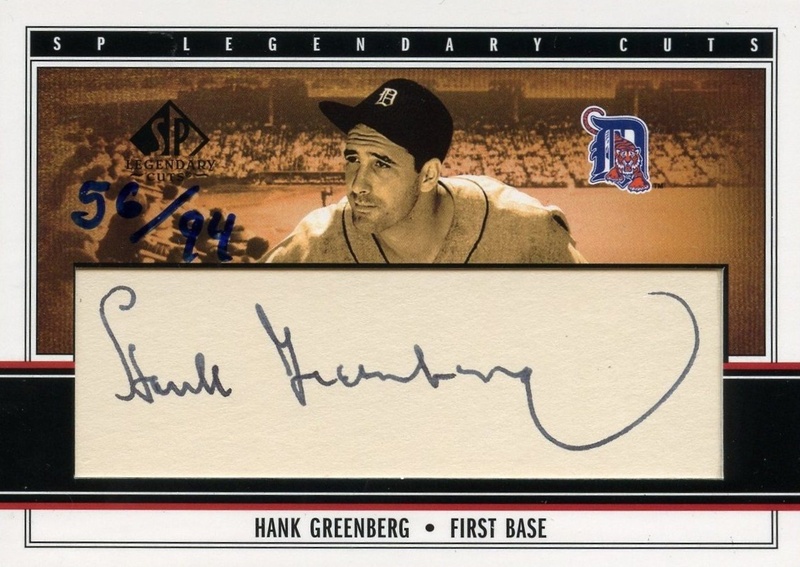 His looped "H" and the backwards loop on the "g" of Greenberg are also trademarks of his autograph style. Again, collectors have multiple Greenberg cards to choose from in the 1938 Goudey set that has become known as the Heads-Up set. 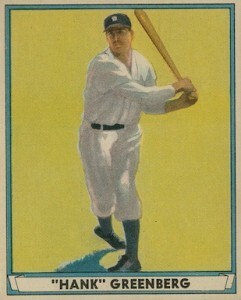 Card #255 features Greenberg swinging for the fences with a clean background while his card #277 has the same design with several additional drawings that clutter up the background. The additional information tells us Hank plays first base, that he attended New York University, and that has a propensity to hit home runs. Collectors have placed a slightly higher value on Greenberg's second appearance as it is in the high-number series printed at the end of the set's run. 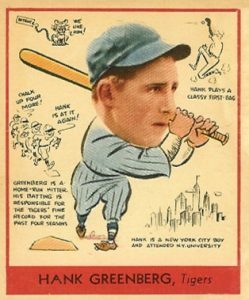 With Greenberg becoming a full-time player during the 1933 season, his 1934 Goudey card is about as close to a rookie card as collectors can come. The card's reverse side features a write-up attributed to Lou Gehrig, who would become Greenberg's main rival in the debate for the best American League first baseman. His '34 Goudey is without question his most popular card and graded copies achieving just an excellent grade can top $500 at auction. Those rare elite-graded cards can command prices many times that price. HANK GREENBERG, CHARLIE GEHRINGER, GOSLIN BAT JERSEY CARD! THEIR NUMBERS 2 5!!! 1935 R309-2 Goudey Large Premium Hank Greenberg Detroit Tigers 2nd YEAR! have a signed hall of fame card from Hank,it was a sharpie pen,when he signed he put his thumb print in the signature,anything? What about the 1936 World Wide Gum Greenberg? Card #41 is super rare and should be in the top! That’s a good one too. Narrowing any list means something has to be left off. 1939 Play Ball #56 Hank Greenberg HOF PSA 6 ! !